NASA’s Hubble Space Telescope has found a blistering hot planet outside our solar system where it “snows” sunscreen. The problem is the sunscreen (titanium oxide) precipitation only happens on the planet’s permanent nighttime side. Any possible visitors to the exoplanet, called Kepler-13Ab, would need to bottle up some of that sunscreen, because they won’t find it on the sizzling hot, daytime side, which always faces its host star. Hubble astronomers suggest that powerful winds carry the titanium oxide gas around to the colder nighttime side, where it condenses into crystalline flakes, forms clouds, and precipitates as snow. Kepler-13Ab’s strong surface gravity — six times greater than Jupiter’s — pulls the titanium oxide snow out of the upper atmosphere and traps it in the lower atmosphere. Astronomers using Hubble didn’t look for titanium oxide specifically. Instead, they observed that the giant planet’s atmosphere is cooler at higher altitudes, which is contrary to what was expected. This finding led the researchers to conclude that a light-absorbing gaseous form of titanium oxide, commonly found in this class of star-hugging, gas giant planet known as a “hot Jupiter,” has been removed from the dayside’s atmosphere. The Hubble observations represent the first time astronomers have detected this precipitation process, called a “cold trap,” on an exoplanet. Without the titanium oxide gas to absorb incoming starlight on the daytime side, the atmospheric temperature grows colder with increasing altitude. 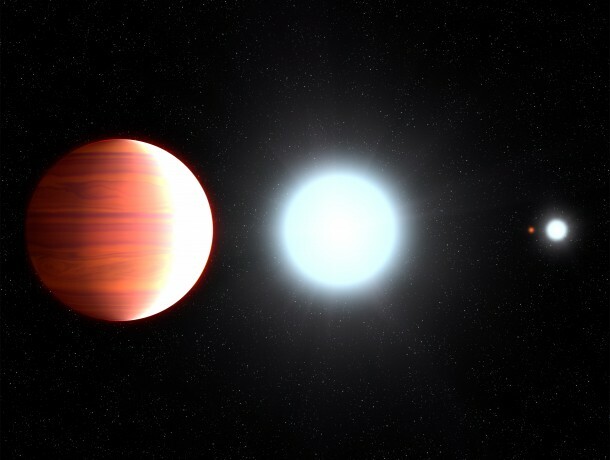 Normally, titanium oxide in the atmospheres of hot Jupiters absorbs light and reradiates it as heat, making the atmosphere grow warmer at higher altitudes. These kinds of observations provide insight into the complexity of weather and atmospheric composition on exoplanets, and may someday be applicable to analyzing Earth-size planets for habitability. Beatty’s team selected Kepler-13Ab because it is one of the hottest of the known exoplanets, with a dayside temperature of nearly 5,000 degrees Fahrenheit. Past observations of other hot Jupiters have revealed that the upper atmospheres increase in temperature. Even at their much colder temperatures, most of our solar system’s gas giants also exhibit this phenomenon. The observations confirm a theory from several years ago that this kind of precipitation could occur on massive, hot planets with powerful gravity. The researchers used Hubble’s Wide Field Camera 3 to conduct spectroscopic observations of the exoplanet’s atmosphere in near-infrared light. Hubble made the observations as the distant world traveled behind its star, an event called a secondary eclipse. This type of eclipse yields information on the temperature of the constituents in the atmosphere of the exoplanet’s dayside. The Kepler-13 system resides 1,730 light-years from Earth.